Bristol-Myers Squibb Co.'s planned takeover of Celgene Corp. is the latest and strongest vote of confidence yet in the burgeoning field of cell and gene therapies, an innovative method of treating — and potentially curing — diseases from cancer to rare disorders. Bristol-Myers, after agreeing to buy Celgene in a deal valued at $95 billion, noted that the two cell therapy candidates in Celgene's pipeline, JCAR017 from Juno and bb2121 from bluebird bio Inc., made the first big acquisition of 2019 more enticing. Celgene's $9 billion purchase of Juno Therapeutics in 2018, almost exactly a year before Celgene itself became a target, was among $20 billion in mergers and acquisitions in the cell and gene therapy space, or regenerative medicine, that year, according to the Alliance for Regenerative Medicine. The U.S. approval of three regenerative medicines — Novartis AG's Kymriah, Gilead Sciences Inc.'s Yescarta and Spark Therapeutics Inc.'s Luxturna — in 2017 may have inspired that round of dealmaking. Now, as the market becomes more established and research activity builds, both big pharmaceutical companies and smaller biotechs are seeking to gain ground in what could become a medical arms race. "In 2017, we knew the next wave [in biotech] was gene therapy," said Bradley Campbell, COO of Amicus Therapeutics Inc., which bought gene therapy developer Celenex for $100 million in 2018. There are 906 regenerative medicine companies worldwide, which include those focused on gene therapy and cell therapy, according to the Cell & Gene Therapies State of the Industry Briefing on Jan. 7. 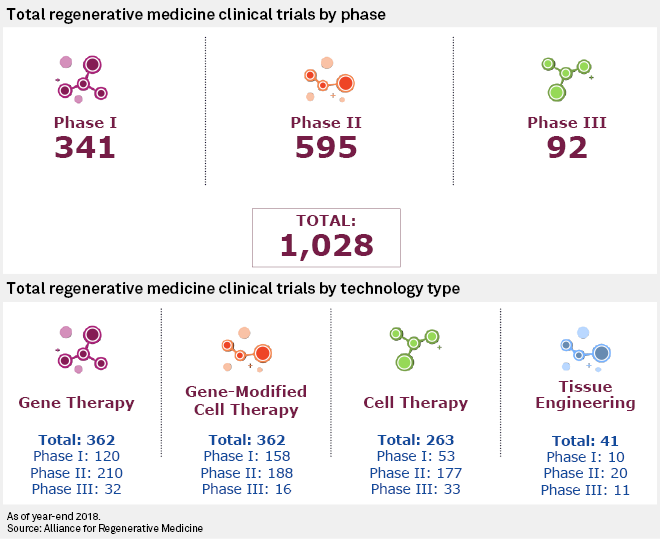 There were 1,028 clinical trials in regenerative medicine counted in 2018. The U.S. Food and Drug Administration also noted the influx of cell and gene therapies, with Commissioner Scott Gottlieb predicting that by 2020, the agency will receive more than 200 investigational new drug applications per year. Gottlieb added in his Jan. 15 statement that the FDA has "more than 800 active cell-based or directly administered gene therapy INDs on file." By 2025, the FDA may approve 10 to 20 cell and gene therapy products a year, he said. One of these could be Novartis' gene therapy Zolgensma, used to treat spinal muscular atrophy. Zolgensma was granted FDA priority review at the end of 2018, and CEO Vas Narasimhan touted the speed by which the therapy has been embraced in the regulatory process. "What's exciting about this space, we've proven with [spinal muscular atrophy] type 1, is that with truly compelling data in a single phase 1 trial, you can get to registration" with a regulatory authority, Narasimhan said. "So you really change the dynamic in terms of R&D investment and timelines when you can bring that kind of transformative efficacy to patients." That compares to the two decades it took to bring the first approved gene therapy, Glybera, to market in the EU. However, Glybera's manufacturer, uniQure NV, ultimately decided to withdraw the product following limited demand. While the field has had a slow start, so did monoclonal antibodies, executives and researchers have said. Scientists developed a technique for producing these cell-derived, or biologic, treatments in the 1970s, and they are now a mainstay of treatment for cancer, autoimmune disorders and many other diseases. The world's best-selling medicine in 2017, AbbVie Inc.'s Humira, is a monoclonal antibody. "If you take a step back and think about the world of therapeutics, people had small molecules for a long time, and then the big revolution was biologics," said Armon Sharei, CEO of SQZ Biotechnologies Co., a Massachusetts-based developer of cell therapy technologies. "Cells are an even bigger leap, because finally you're using these complex biological machines, and they can do so much more than any small molecule or biologic ever could," Sharei told S&P Global Market Intelligence. "While we're living in generation one right now, it's the future generations that are really going to start to turn heads." To get to where monoclonal antibodies are now, cell and gene therapies need to overcome several challenges, from pricing and reimbursement to scaling up manufacturing. Bristol-Myers CEO Giovanni Caforio said on Jan. 7 at the J.P. Morgan conference that these obstacles could be resolved by the time the company's products reach the market. "This is one case in which maybe coming in a little bit later is going to be an advantage ultimately," Caforio said. At Novartis, manufacturing has been a bottleneck preventing revenue growth in the area, Narasimhan said at the conference. But the company has sought to address that by buying up cell processing companies around the world — like Paris-based CELLforCURE SASU — and working with Japan's CBRI and China's Cellular Biomedicine Group Inc. to scale up its manufacturing. "Taken together, we're building this global manufacturing footprint with a mind to having a platform capability that enables us to continue to bring in technologies that allow us to reprogram cells and hopefully cure human disease," Narasimhan said. "It's a significant opportunity, but it will take long-term sustained investment to build the capability." Meanwhile, Novartis's crosstown rival Roche Holding AG has enlisted privately held SQZ for up to $1 billion in milestone payments. SQZ created a device that constricts cells to the point where small holes are formed in their outer membranes, allowing genetic material to pass through. The powered-up cells are then able to recognize antigens on a cancer cell, prompting an immune response. What SQZ offers is a device that has the potential to be faster and less expensive than the current methods of electroporation, Sharei told S&P Global Market Intelligence. "It's got to be more cost-effective than what it is today," Sharei said. "What people do today is so expensive and difficult that you have to be able to cut down that time and cost to make this a reality not just within cancer but especially going outside of it where the willingness to pay can drop significantly." Smaller companies are building their own gene therapy pipelines as well. Amicus Therapeutics, which specializes in rare diseases, is collaborating with the University of Pennsylvania to develop adeno-associated virus gene therapies, thus bringing to the Cranbury, N.J.-based company's portfolio a total of 14 gene therapy programs. Cambridge, Mass.-based bluebird bio said during its Jan. 8 presentation at J.P. Morgan that it expects approval or near approval for four gene therapy products by 2022, including a one-time treatment for transfusion-dependent beta thalassemia following the expected EU approval this year. Bluebird bio also recently unveiled a partnership with fellow biotech company Inhibrx Inc. to develop new CAR-T cell therapies for cancer. 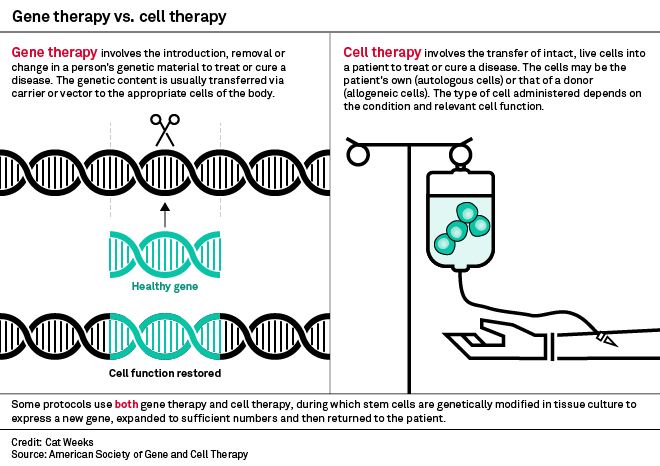 CRISPR gene-editing companies Editas Medicine Inc. and Intellia Therapeutics Inc. are also delving into cell therapies by way of hematopoietic stem cells — an area where cell and gene therapies overlap. Hematopoietic stem cells originate from the blood or bone marrow and give rise to differentiated blood cells. Other stem cells that could be used for genetically modified cell therapies include those that come from the placenta, according to Celgene spinoff Celularity Inc., which had been the now-acquired cancer company's cell therapy unit. 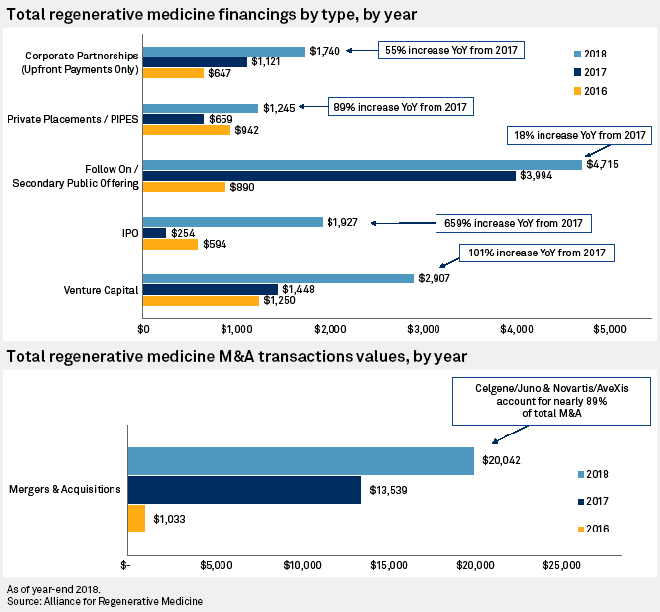 At J.P. Morgan, Editas CEO Katrine Bosley called the regenerative medicine field the "future of medicine" and was not the only one to underline the excitement around the curative and durable properties of gene and cell therapies. "We realized early on that cell therapy had enormous potential for the future and that we could be a part of that, and we could embark on an endeavor that would evolve over many, many years," Gilead Chief Scientific Officer John McHutchinson said. "So that is the basis of the investment: long-term."